Paying homage to the folkloric roots of Colombia, and combining hypnotic traditional Indigenous melodies with rhythms of the Afro-Colombian diaspora, Aire fuses cultural roots with a contemporary flavour. Hypnotic chanting soundscapes created by a frontline of female singers and musicians have the power to transport audiences to the tropical lands of the Atlantic and Pacific shores of Colombia. 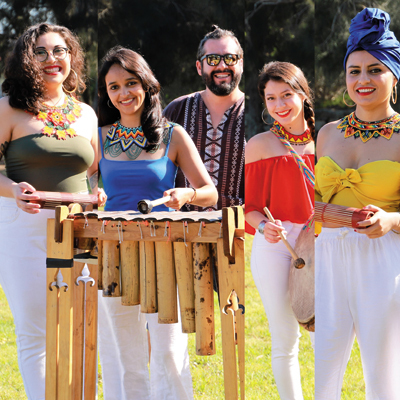 Aire revives powerful sounds from the Pacific through rhythms like bunde, porro, and currulao, and referring to traditional instruments like Marimba, Cununo, Guasa and Bombo. Performing Cumbia, Bullerengue, and Champeta from the Caribbean, they will refer to instruments like tambora, maracas, llamador, alegre and gaitas. Creating fusional sounds with guitar and drum, Aire merges between the quirky realms of traditional folkloric and the energetic beats of modern music.